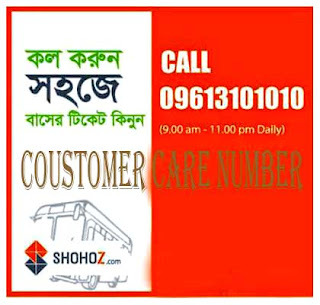 Shohoz.com is operated and owned by the Shohoj Limited. It’s a high quality online travel service provider aiming to make travel simple and convenient in Bangladesh. The passion that drives it to better service, Shohoz.com has achieved the pioneer position in the online travel industry. It offers bus and launch tickets throughout the country along with the tickets of the movie and entertainment sectors. Moreover, it provides cricket match tickets and some other event tickets as well. Shohoz.com makes your travel easy and simple with empowering the travelers all over in Bangladesh. It enables its customers to get certainty to their travel timetables. It comes with some young and energetic team professionals having deep e-commerce experience. The team offers its best effort through the services within minimal costs through the user-friendly website, Android phones’ app and the partners’ networks across Bangladesh. It also offers highly qualified team members to operate a multi-lingual call center for the best customer service. Shohoz.com contact number: Just call 16374 to make bookings done. A trusted customer service is backing by Shohoz.com with excellence operations. It provides information regarding to the prices, timings, availability and booking facilities to get bus and launch tickets, movie, events and cricket match tickets. Customers have options to get touched with Shohoz.com easily through simple phone calls, emails and website access to make their bookings. Shohoz.com has made their payment system secure and simple for their customers as well. The customers can pay their tickets’ price via debit and credit cards, mobile payments system of bKash and cash. The services come with Cash on Delivery (CoD) which makes your tickets at your doorstep. Why Shohoz.com to buy tickets? § You can buy bus, launch, movie, events, and entertainment show and cricket tickets anytime and from anywhere. § You can pay bills via credit and debit cards, mobile banking system or cash. § Get your desired tickets at your doorstep. § Trusted customer care service from 8AM to 11PM. You can buy Eid travel tickets from Shohoz.com easily. Just get the android app Shohoz from the Google Playstore and get all set instantly.